30,000 people were evacuated this weekend from several villages in the Vinnytsia region in northwestern Ukraine due to a fire that hit one of the country’s largest ammunition depots.Firefighters have struggled to douse the flames and explosions at the site continue, sending clouds of thick grey smoke into the sky. The base, which held about 138,000 tonnes of ammunition, is located in the city of Balaklia, about 100 km (60 miles) from the frontline of Ukraine’s war against Russian-backed separatists. The fire, which began on Tuesday night in the city of Kalinivka, Ukraine, for unknown reasons, led to a series of explosions that have resulted in the loss of more than 10 percent of the military stockpile there, the General Staff said. According to sources at the Ministry of Defense of Ukraine, the burned tank has about 60 hectares and stored approximately 188,000 tons of ammunition. Ukrainian Security Services are investigating the causes of the fire, although they do not rule out the possibility of a “sabotage” of the country’s Armed Forces. Local authorities blocked traffic on several railway lines as well as on the roads that connect this region with the country’s capital, and have also ordered to close of the air space within a radius of fifty kilometers of the fire zone. 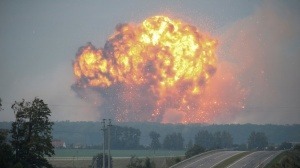 The Ukrainian president, Petró Poroshenko, called an emergency military cabinet to evaluate what happened. Despite this fire was caused by a “sabotage”, it is very possible that the tank did not have adequate fire protection systems or that they have not undergone adequate maintenance. Smoke evacuation and fire protection systems also have to go through maintenance and control to verify that everything is working properly.